This study provides novel evidence on the impact of labor market institutions on current account dynamics. 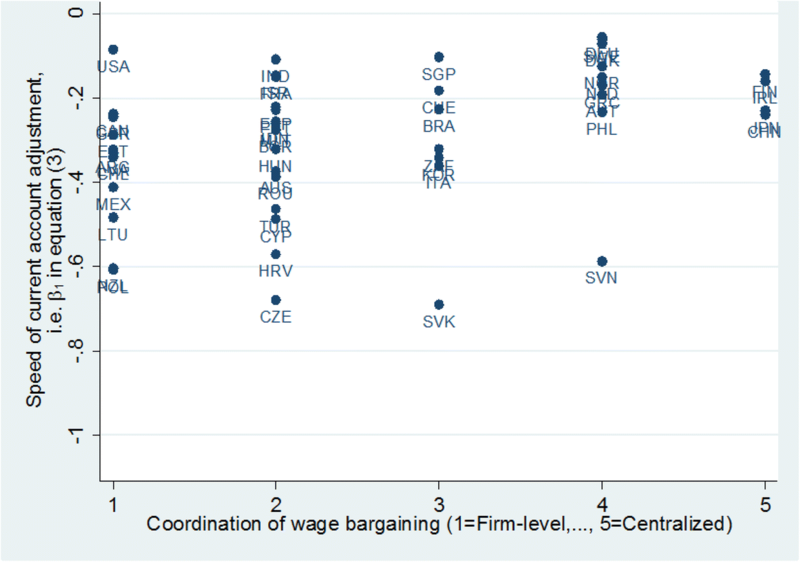 Our results suggest that a high degree of coordination of wage bargaining has a positive effect on the current account balance over the long run. This result is not driven entirely by wage moderation induced by centralized wage setting. 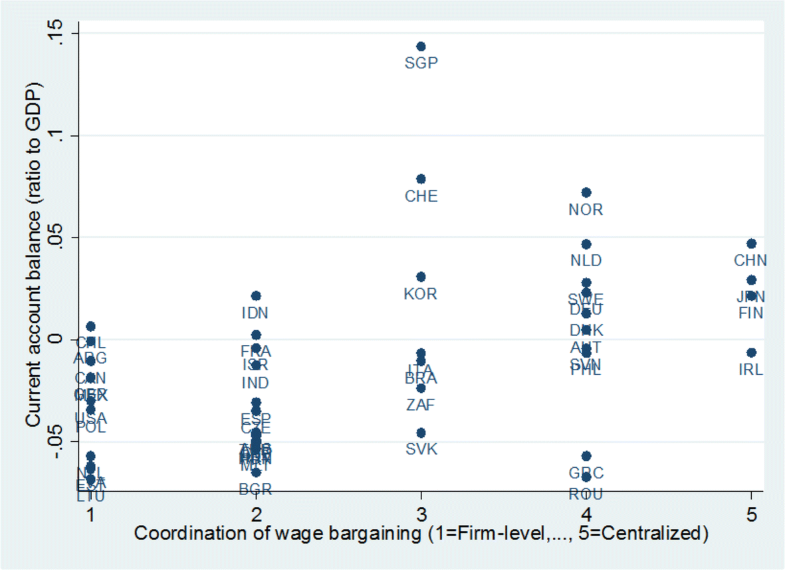 We also provide robust evidence that a high degree of coordination of wage bargaining is associated with a slower current account adjustment toward its long-run equilibrium. 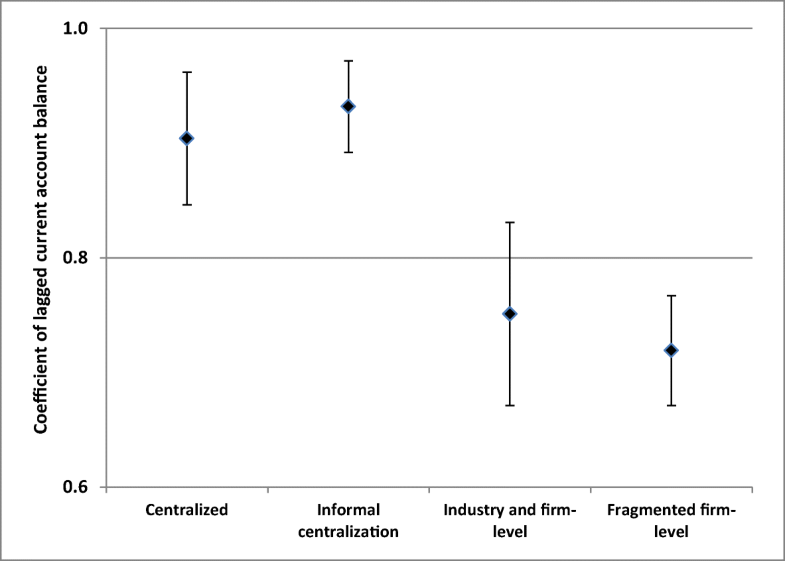 This result seems theoretically plausible; the aggregate shocks in the exporting sector are largely driven by idiosyncratic shocks and the presence of idiosyncratic shocks increases the importance of labor market flexibility. Overall, our analysis of the impact of labor market institutions on current account dynamics complements the existing empirical current account literature focused on macroeconomic and financial measures. The online version of this article ( https://doi.org/10.1007/s11079-018-9511-2) contains supplementary material, which is available to authorized users. 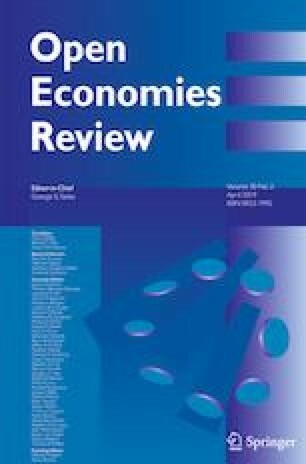 We thank two anonymous referees, Ansgar Belke, Stephen G. Hall, Sercan Eraslan, Niku Määttänen, Tomi Kortela and the other participants at the 21st Annual International Conference on Macroeconomic Analysis and International Finance, FDPE Macroeconomics Workshop I/2016, Finnish Economic Association XXXVIII Annual Meeting, BOFIT seminar at the Bank of Finland, as well as Zuzana Fungáčová, Juho Jokinen, Mika Maliranta and Matthias Strifler for useful comments and suggestions. Mika Nieminen acknowledges financial support from the OP Group Research Foundation, the Alfred Kordelin Foundation and Bank of Finland Institute for Economies in Transition. This study is part of the work of the JSBE Research Group on International Macro and Finance (JyIMaF) which acknowledges financial support from the OP Group Research Foundation. Current account balance (ratio to GDP). Mode of coordination of wage-setting during sample period. 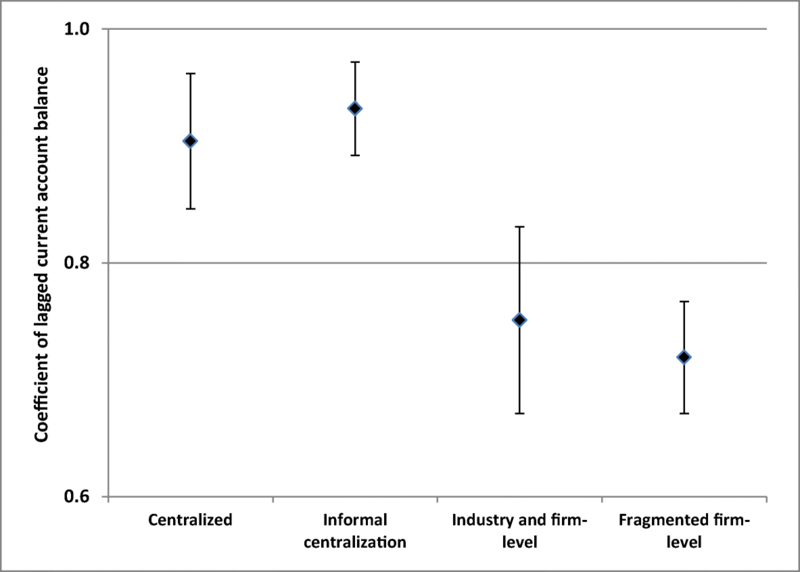 1 = fragmented firm-level wage bargaining, 2 = mixed industry and firm-level bargaining, 3 = informal centralization, 4 = centralized bargaining without peace obligation, 5 = centralized bargaining with peace obligation. International Country Risk Guide: Democratic Accountability. Scaled between 1 and 6. Mean of the Chinn-Ito index during the sample period. The index measures financial account openness. Scaled between −1.87 and 2.44. Mean of the exchange rate stability index during the sample period. The index is normalized between 0 and 1. Larger values imply more stable exchange rate. 95% confidence intervals for ρ1 in Eq. (5).